A critique of the world in which Kannadigas live and let live. A Sanskrit-Kannada dictionary 'Samskṛta Padagaḷige Kannaḍaddē Padagaḷu', co-authored by Dr D N Shankara Bhat, Y Bharat Kumar and myself was released on the 5th of August. There are several Sanskrit-Kannada dictionaries that are already available. But this dictionary is different from all of those in several ways. The Kannada synonyms provided in the dictionary are native Kannada words. In other Sanskrit-Kannada dictionaries, one can see mostly Sanskrit words as Kannada equivalents. For example, in one such dictionary, 'buddhi' and 'prajne' are provided as Kannada equivalents of the Sanskrit word 'Dhi'. But interestingly, both these 'Kannada synonyms' are in fact Sanskrit words. Similarly, in providing 'yuvati' for 'taruni' and 'svikara' for 'parigrahana', one can see that the Kannada synonyms provided are actually Sanskrit words. To an average reader it would be impossible to know which of the synonyms are actually native Kannada words and which ones among them are of Sanskrit origin. 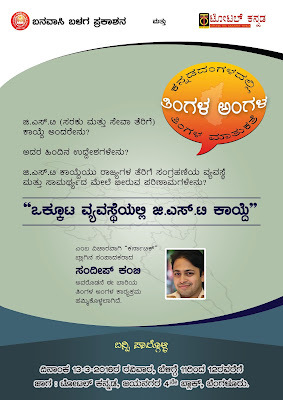 This new dictionary will be of great help to such a reader who would want to know native Kannada words. It is well known that Kannada authors use plenty of loan words, especially those of Sanskrit origin, that are not easily comprehensible to an average Kannada reader. This is particularly true for scientific literature in Kannada. In science and technology, there is always the need to coin new words. Whenever there is such a need to coin a new word to describe a new invention or a new scientific concept, Kannada authors have mostly resorted to Sanskrit. Such a practice has made the scientific vocabulary hard to comprehend. Such words are not only difficult to understand but also coining such new words to express newer and more advanced concepts becomes increasingly difficult. As a result it affects the overall educational progress of the language community. In other words, using familiar native Kannada words to build vocabulary in any subject will only help increase comprehensibility in general, and gradually improve the levels of education overall. In fact, there are two schools of thought. One, as mentioned above, believes in resorting to Sanskrit to build new words. The other believes in borrowing vocabulary from English. But to a common Kannada reader or student, both English and Sanskrit are unfamiliar and hence any vocabulary built based on either of these languages will only make the concepts difficult to comprehend. Most of the readers would be forced to rote learn, than understand. Therefore it makes a lot of sense to construct new words in Kannada, which is easily comprehensible. 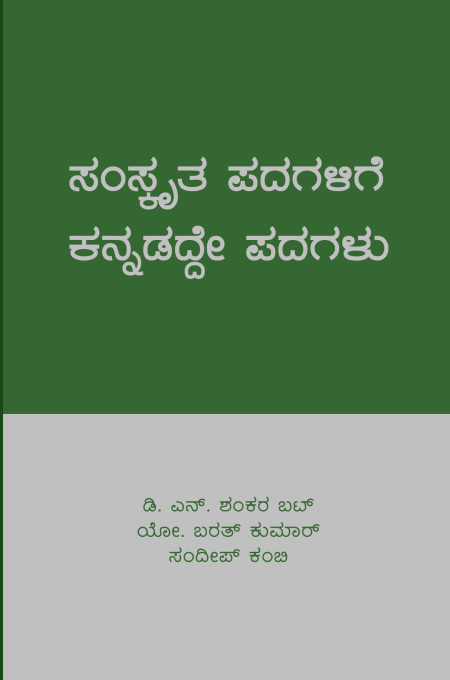 The book has about twenty five thousand Kannada words, provided with examples of usage in sentences and other word forms. To people interested in using native Kannada words and to those interested in building and coining new words in Kannada, the dictionary will give a good idea on an approach to coin and use native Kannada words. Hindi academics and writers, a hundred and thirteen of them, from different parts of India have reportedly written a letter to the Prime Minister Narendara Modi and the Home Minister Rajnath Singh urging them not to entertain any requests to add 'Hindi dialects' into the Eighth Schedule of the Constitution. Bhojpuri, Maithili, Awadhi, Rajasthani, and several more are termed as dialects of Hindi. They are spoken across a vast stretch of landmass across the northern plains and together account for a little more than 40% of all of India's population. But the fundamental question - are they really dialects of Hindi? To answer this question let us understand what Hindi is. Hindi or Standard Hindi is the modern literary form of Khariboli, which is spoken in the western parts of today's Uttar Pradesh. It was standardized in the 19th century with a heavy borrowing of vocabulary, especially technical and administrative, from Sanskrit. In its spoken form, essentially it is nothing but Khariboli. Awadhi, which neighbors Khariboli, has been in parallel existence for ages. The famous Ramacharitamanas of Tulsidas, that is now appropriated as ancient Hindi work, is in fact written in Awadhi. Linguists group Awadhi in the Eastern subdivision of Indo-Aryan languages, while Khariboli, is grouped in the Western. How can a language be considered a dialect of another language that belongs to a different linguistic division? Like Awadhi, Bhojpuri, Maithili, Magahi, which are often termed as dialects all belong to the Eastern division. In comparison with Khariboli, Rajasthani languages fall under a completely different zone of Indo-European languages, and linguistically are much farther away. Their linguistic proximacy leans more towards Gujarati and Khandeshi - a language spoken in parts of Northern Maharashtra - than towards Hindi. So, in reality, a large number of northern Indian languages wrongly deemed dialects of Hindi, are distinct languages belonging to different linguistic zones and divisions under the Indo-Aryan language family. We often hear that Hindi is the largest spoken language in India, and that its native speakers number more than 40% of India's population. This huge number becomes possible when many such independent languages are brought under the Hindi hood as its dialects. As per this GoI's website, more than 49 languages were considered as dialects of Hindi in the 2001 census. Movements in Bihar and Rajasthan, over the past several years, have been demanding their languages, Bhojpuri and Rajasthani respectively, be recognized as independent ones and be included under Schedule Eight. Their demand is well-grounded and it is their right to get their due. So if it is so fair, why are Hindi academics crying foul? The answer lies in Hindi fanaticism. It is this fanaticism that has ensured the declaration of Hindi as the sole official language of the Union, with constitutional sanction to impose the language on all of India's peoples, even if they are unwilling. Constitutional sanction does not only imply that a few academics or a section of people believe in Hindi fanaticism. It also clearly exposes the imperialist attitude of the Delhi establishment. Fanaticism has also slyly made sure to build a false association of Hindi with Indian nationalism. Such a false association was built on the myth that most of India (read it northern India) speaks Hindi as its native language. As large as 40%. And to add to it, it was propagated that another large portion of the population understands Hindi and it makes all the more sense for the remaining 'minuscule' population to learn and use the language. This way all Indians could communicate freely, and achieve 'national integration'. Sounds Utopian, but reality is far different. Now that the speakers of Hindi 'dialects' are increasingly becoming aware of their rights the threat to this utopia, built on myths, appear imminent. This is so plainly evident in the professor's statement in which he questions what will be left of Hindi now? Clearly they are threatened by the developments in Bihar and Rajasthan, two prominent states of the Hindi belt. To a Hindi fanatic, it is fine to deny the right to identity and recognition to language communities. It is all fine if speakers of these languages are denied their right to education in their language. Denying their right to administrative use of their language is not a serious issue. After all, it is a small sacrifice in return. It is the same logic that is applied on language communities of the South and elsewhere too. Hindi in administration is imposed on them. What else justifies the official language status to Hindi alone in a union where hundreds of languages are spoken? It is good to see an increased linguistic awareness in people. It is good for the Union of India, as a whole as well. For, we cannot have a stable union with a vast section of the population being denied their basic linguistic human rights for long. It will shatter us some day. So, in the interest of the union and in acceptance of people's linguistic rights, the union should accord them the due recognition. In a democracy people's rights are far more important than Hindi-chauvinistic intentions of the Delhi establishment and people with similar beliefs in the academia. Ever since the demonetization decision was made public by the Union Government of India, on the 8th of November 2016, lot has been discussed about the pros and cons of the measure. However, not much has been discussed about the measure from the federalism angle. In this article, we try to look at the whole demonetization exercise from the federalism point of view. In many mature democracies, the taxation powers are distributed between the states and the union (also called as ‘federal’) governments. Not just the indirect taxes, even the direct taxes like Income tax and Corporate tax powers are with the state governments too. In federal polities like USA, Canada or Australia, this is the norm. In India however, the powers to levy direct taxes rest solely with the Union Government. This in itself is, over-centralization of powers. When nations like Canada and Australia with population of 20-30 million take fiscal federalism seriously, what stops the highly diverse nation with a population of 1.25 billion from taking fiscal federalism seriously? In the previous paragraphs, we discussed about direct taxation powers. Because by definition, black money is the amount for which direct tax has not been paid. By retaining the power to levy direct taxes, the union government has kept to itself all the incentives to fight tax evasion. Had the state governments been provided with direct taxation powers, as is the case in mature democracies, the union would have found natural allies in all the state governments in the fight against tax evasion. The current approach, taken by the Union Government to catch tax evaders, is more like ‘Forcing’ the state governments into action. Quite naturally, when something is forced upon someone, the reluctance levels will be high and enthusiasm levels will be low. Needless to add, that in a federal setup, such moves are against the fundamental principles of federalism. The frequently heard term of “co-operative federalism” appears to be lacking any substance, considering the current approach. For co-operation between any two elected governments, there must be an incentive at play. Had the direct taxation powers been in concurrent list, the resulting bounty from the fight against tax evasion would have been an incentive, for both the union and the state governments. To tackle tax evasion, whether it is the USA working with Switzerland, or Germany working with Panama, the approach one can see is that of ‘carrot & stick’. That is how co-operation is achieved, and is made effective. “Stick alone” approach, doesn’t build a strong and effective co-operation. The demonetization exercise by the union government is akin to “stick-only” approach, and is evident that there was no effort to build consensus among the state governments and the union. This one exercise has strained the federalism-fabric so much, that we might start hearing the benefits of common currency across the union of India being questioned. The other India speaks and demands #GoIMakeMyLanguageOfficial ! Hindi was falsely claimed as a national language of the Indian Union and time and efforts of considerable scale was spent by the Union government in its propagation. For decades there was hardly any resistance to this undemocratic and anti-federal move by the Union. Things started to change in the last decade with Tamil, Telugu, Marathi, Kannada, Bengali, Punjabi voices coming together to demand an end to Hindi hegemony and seek equal status to all scheduled languages of the Union. Access to social media has given a platform for people to rally around and demand language equality. Quite naturally this has upset the Hindi lobby in Delhi and efforts to impose Hindi have multiplied in the last few years only to see a bigger resistance from the Non Hindi speaking citizens. Hindi Divas, a day when the Union government doles out prizes, awards and promotions to its employees who use and promote Hindi in its administration is a black day for the democracy in India. Union government runs hundreds of offices across the country offering various citizen services to different peoples of India. It’s nothing but common sense that for effective delivery of these services, the government should speak the language of the governed. An overzealous government that sees Hindi as the only true identity of India thinks otherwise and hence spends crores of taxpayers’ money in mindless and dumb celebrations like Hindi Divas causing much heartburn and anger among non-Hindi speakers. This year’s Hindi Divas was protested on social media with a huge twitter campaign carrying the hash tag #GoIMakeMyLanguageOfficial. More than a thousand twitter users speaking various Indian languages came together and expressed their anger against the continued neglect of their languages by the Union and demanded official status to their languages too. This raised the hackles of those in power and we saw two statements coming from Delhi. Union Home Minister Rajnath Singh, a Hindi speaker himself, said “Some people are trying to create a rift in different parts of the country in the name of language,” in his address at the Hindi Divas function. It is apparent that he was referring to these linguistic equality groups in general and the Twitter hashtag which was trending nationally throughout the day in specific. Minister of State, Home Ministry, Kiren Rijiju also entered into damage control mode quickly after, giving a clarification that Centre was against imposition of Hindi but would continue to promote Hindi as envisaged in the Constitution. He was referring to Article 351 which has made it “the duty of the Union to promote the spread of the Hindi language and to develop it so that it may serve as a medium of expression for all the elements of the composite culture of India”. It is this very article which has allowed successive Central Governments to impose Hindi on non­ Hindi speaking peoples of India in the name of its promotion. The linguistic equality groups therefore want the article to be gone for good as it is against the very fundamental spirit of equality of both status and opportunity for the non ­Hindi speakers who form the majority of India. While the Hindi lobby aggressively pushed for a monolingual policy, strong resistance by leaders from non ­Hindi regions ensured that India would at least remain officially bilingual. However, the constraints which restricted India to be officially bilingual no longer hold. The unprecedented recent technological progress can smoothly facilitate India’s transition from a bilingual to a multilingual democracy. The Union Government which is betting on schemes like Digital India to reach India’s masses should voluntarily be looking to push for amendments and update the outdated language articles to make it reflect the changed realities of today. It is unfortunate that it is instead going the other way and denying the majority of India services and opportunities in their languages even though they have become both possible and feasible. The Centre being a collective Union and a representative of all of India should either promote all languages or make the promotion of all languages including Hindi the responsibility of states where they are native. Spending all taxpayers money on promoting just one region’s language is grossly unjust and must stop immediately. Kiren Rijiju also reminded the states of their responsibility to promote India’s other languages. The million dollar question though is why the Centre doesn’t entrust the promotion of Hindi with the ten Hindi speaking states, while it entrusts the promotion of other Indian languages with states even though most such languages have official status in at most one or two states. The Centre being a collective Union and a representative of all of India should either promote all languages or make the promotion of all languages including Hindi the responsibility of states where they are native. Spending all taxpayers money on promoting just one region’s language is grossly unjust and must stop immediately. Rajnath Singh talked of how Prakrit was the common language in ancient India and justified its descendant Hindi being modern India’s common national language. His statement makes sense if one considers only some of its northern and western parts as India, but is grossly incorrect if one considers the whole of India. Northern and western India speaking Prakrit/Hindi as a common language is no reason for the Indian Union to proclaim Hindi as its lingua franca and spread it from Kashmir to Kanyakumari, from Agartala to Vadodara and even to the secluded islands on both sides of India’s peninsula. The annual Hindi celebrations is just an example which shows the level and kinds of special treatment Hindi receives at the cost of other languages. The Union Government owes each and every one of us service and opportunities in our languages and every language an equal status and this is exactly what the Twitter campaign #GOIMakeMyLanguageOfficial demanded. The linguistic equality movement is no longer restricted to protests against attempts of Hindi imposition alone but it wants all the unfair language articles to be repealed and the Official Language policy to be amended paving way for an officially multilingual India with all its 8th Schedule Recognized languages becoming Official Languages in letter and spirit. Finance Minister Arun Jaitley, in this year’s Annual Budget, proposed for an agreement to be signed between the Union and the states to facilitate smooth implementation of Bilateral Investment Treaties (BITs) that India is set to enter into with the nations of the world, replacing the existing Bilateral Investment Protection and Promotion Agreements (BIPPAs). While signing this agreement is not mandatory, the perception that states which sign the agreement are better investment destinations than states which do not, will serve as an incentive for the states to sign the agreement. The primary objective of the Centre-State Investment Agreement (CSIA), as the agreement is called, is to ensure fulfillment of state governments’ obligations under these bilateral treaties. Many a time, investors feel cheated because of a state’s failure to fulfill the promises made by the Union while signing the agreements. But signing the CSIA will bind the states to fulfill their commitments, bringing in some accountability into the whole business. CSIA is the first such move to actually involve the states in an area which has been exclusively Union's realm so far. However, critics rightly argue that CSIA will have very little legal significance should investors approach international courts for arbitration. Irrespective of any agreements signed between the Government of India and its states, only the former can be held liable and accountable externally. This is because only the Union Government has the power to enter into treaties on behalf of the Indian Republic and once it has acceded to its terms, the international obligations assumed thereunder bind the entire country and not any individual states. CSIA can only facilitate shifting of blame for the embarrassment from the Union to the states internally. The introduction of this agreement will also impact federalism in India, an area which clearly does not feature among the strong points of Indian polity. The states will not particularly be impressed with yet another provision which will enable Delhi to shift the blame to their capitals. Creation of a negative perception about a state’s investment ecosystem should it excuse itself from signing the agreement and Union's plans to inform investors beforehand about states which have not signed the CSIA will further make the states feel that the agreement is unfair on them, which is understandable since the states have little say in the provisions of the bilateral treaties itself in the first place. A solution for this would be to institutionalize the involvement of state governments in the treaty-making process. The states will not find the CSIA unfair if they themselves are involved in formulation of the provisions of these treaties. The Chief Ministers of states can be made members of a consultative commission on treaty making (like the Governing Council of Niti Aayog) and this need not just be restricted to investment treaties, but can also be extended to other international agreements like the WTO treaty, Free Trade Agreements and Double Taxation Avoidance Agreements. Many of these agreements involve domains like agriculture which fall under the State List and directly impact the states, and it would only be logical on the part of Union Government to include actual stakeholders. CSIA featured in discussions held at the recent Inter-State Council Meeting, with Tamil Nadu Chief Minister Jayalalitha welcoming the Union's move to include states in the treaty-making process and also raising some of her reservations about the draft CSIA agreement. There is a possibility that the Union might try to pass on some financial burdens it might suffer from penalties under already existing bilateral agreements, which she feels is unfair since states are neither party nor aware of the provisions of earlier treaties. She also expressed her concern that the Union deducting such dues from the amount it transfers to states, would impact the implementation of schemes of state governments, and called for the deletion of the provision which enables the Union Government to resort to this practice. Centre State Investment Agreement will be a commendable and an affirmative step, which will help in bringing some much needed order, accountability and cooperation between the Union and the states in smooth implementation of bilateral treaties, provided it makes the Union and the states part of the holistic treatyformulation process. Otherwise, it may well go on to be yet another provision which makes states liable to the shortcomings of provisions they were not even aware of, in the first place. This is a golden opportunity for the Union Government to show it means no nonsense when it talks of cooperative federalism, and include states as equally responsible stakeholders in foreign investment. Ever since independence, the Union has always tried to accumulate more and more power for itself in all subjects of eminence – quietly and gradually cutting down the autonomy of the states. The subject of education is no exception. In fact, education is a key factor for development, growth and governance, and hence exercising control over the matter is key for any authority to hold on to power and accumulate more of it. The Union, time and again, meddles with the subject in such a fashion that it encroaches into the space of the states, one step at a time, seizing more powers with every single move. Obtrusion through National Eligibility Entrance Test (NEET) is the Union Government’s latest fiasco. NEET is a common entrance test for admission to MBBS and BDS courses that starting from this year, will replace All India Pre Medical Test (AIPMT) and all entrance examinations to the above courses conducted by state boards and by private institutions. It will be conducted by the Central Board of Secondary Education (CBSE). As we will see further in this article, in the long-term this will deteriorate into a situation, in which the Union holds complete sway over education, and controls and dictates all learning, and development opportunities of our children. Needless to say, this is quite anti-democratic in nature. The subject of education should be with the states, to ensure the jurisdiction of education remains much closer to people. It makes little sense to drive the all-important subject of education through a distant establishment completely disconnected from them. As with any Union Government undertaking, support for languages has been a concern with NEET. When it was introduced back in 2013, students could take it up in eight languages, i.e., Telugu, Tamil, Gujarati, Marathi, Bengali, Assamese, Hindi and English. But this year, when it is made mandatory across the Union, non-Hindi students do not have the option to take up the phase one of the examination in the language of their choice. They can only choose between Hindi and English. But the phase two of the test is being considered to be conducted in the above mentioned languages. The choices are still limited. There are already concerns that question papers could leak if they are translated to these many languages. Denying the choice of a language not just shows insensitivity towards non-Hindi peoples but also clearly demonstrates operational inefficiencies that were unwarranted in the first place. Why is it that the Union, in most of its undertaking, time and again comes up with operational and executional excuses to deny support to other languages but has enough resources and forethought to support Hindi, any time and at any place? Take the Railways, for instance. The Railways has enough money and resources to use Hindi in announcements, tickets, boards, signage etc in all non-Hindi regions of the Union. But when asked for tickets to be printed in Kannada, it either comes with the excuse of lack of funds or operational inefficiencies. The pattern with NEET is similar. It would not be a surprise if in the near future, the CBSE board puts its foot down and says no more support for ‘regional languages’ in NEET. We often come across the rubbish argument that Hindi and English being widely spoken languages are generally understood by a majority across the Union and that other languages are either not needed or may be left optional. This has been the devious stratagem of the Union in administration and general policy making. Education is no exception. 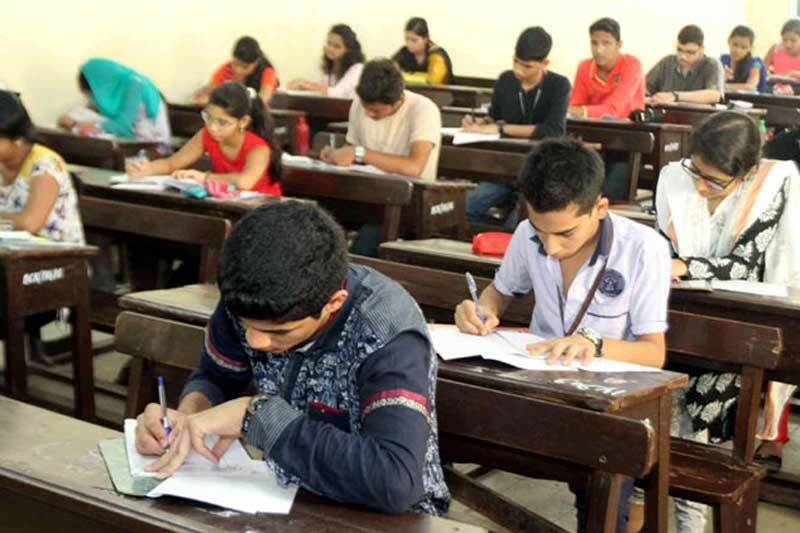 Of course, the Union Government has expressed concerns over phase I of the examination being only in two languages, English and Hindi, citing the reason that it will impact students from non-Hindi states and those from non-English medium background. But it appears that the far-term vision is to gradually converge towards Hindi and English, rather than invest in all the languages in building strong higher education systems in them. That the state governments will lose all authority or control over admission to MBBS and BDS courses in their respective states is crystal clear. Take for example, the Gadinaadu Kannadiga and the Horanaadu Kannadiga quota in Karnataka. Will the Government of Karnataka be able to conduct tests and fill-in admission for these quota? Will the CBSE board or the Union Government allow this? Or can the state government submit a plea if it is not permitted as per rules? We do not know for sure. But the state will no more be able to freely take decisions in the interest of its people. Also, how will the state governments ensure justice to poor and rural students, who mostly do their schooling in the state syllabi? The syllabi of the states are vastly different from each other and from that of the CBSE board. These students are already disadvantaged owing to lack of coaching and guidance. The introduction of NEET will leave them further handicapped. The states will also lose out the opportunity at restructuring or remodeling the system with novel methods. If a state, for instance, wants to adopt an advanced method of testing, or introduce a new subject it will not be possible any more. In the long-run the states also stand to lose authority over primary education. With entrance exams coming under the CBSE board, parents would want their children to take up the CBSE syllabus right from early years of schooling. So, this will ensure that there will be very few takers left for the state boards. And the state boards, with decreasing enrollments, will be forced to align with the CBSE board to remain ‘relevant’ and ‘competitive’. With more schools moving to CBSE, Hindi will be taught more widely in the non-Hindi states. But these schools will not be bound to teach the states’ languages. While the influence of Hindi will increase, the non-Hindi languages will take a beating as lesser and lesser of the young generation of the non-Hindi peoples will have good reading and writing proficiency in their mother tongues. States like Karnataka, Tamil Nadu, and Andhra Pradesh etc., did raise a few objections against NEET. But they have all mostly been related to operational issues. Very few, unfortunately, has been against what is fundamentally wrong with the initiative. NEET definitely needs to be scrapped. But that is not enough. We should ensure that the Union leave education to the states and not get into running the affairs of the subject. That requires moving the subject, which is now on the Concurrent List back to the State List (education was in the State List, but was moved to the Concurrent List during the time of emergency). This is what has given the Union powers to override the policies of the states on education. It is unsure if the current wave of protests will stop NEET. Regardless, the states and its peoples should identify this fundamental fallacy and work towards getting education back to the State List. In the recent past, the Indian Union witnessed two instances of dismissal of democratically elected state governments and imposition of President's rule. They were the result of exercise of the provisions of Article 356 of the Constitution. Per this article, the President is empowered to 'assume to himself all or any functions' of a state government' in the case of failure of constitutional machinery in a State'. So, what is this Article 356 all about? What are its provisions and how democratic are they in principle? What is the article's history in the Indian Union? What were the debates around this subject in the Constituent Assembly? How has it been used (or abused) in independent India since the time it came into effect? What was the impact of Union-States relationship after the Supreme Court's landmark judgement in the 'S. R. Bommai v/s Union of India' case? How has it affected the federal setup of the Indian Union? The Goods and Services Tax is being sold as the best thing that could happen to the system of indirect taxes in the history of the Indian Union. Simplification and streamlining of taxes, uniform taxation across the union, one integrated market, multitude of opportunities to leverage economies of scale, boost to the GDP and significance to the Make in India initiative - the benefits, we are told, are astounding. But what does it mean to the states and their diverse peoples? To begin with, let us look at the history of GST. The proposal was first made in the Union Budget speech of 2006-07. None of the states had asked for it in the first place. The Union Government, nevertheless, wanted to roll out a national-level GST. Meaning, indirect taxes like excise duty, additional excise duty, service tax etc., that fall under the purview of the Union Government, and sales tax, purchase tax, entry tax, entertainment tax etc., that come under the state governments would be subsumed under one national-level tax structure, and that would have no state component. So, the States would get no revenue from goods and services; instead the Union would own and collect all taxes and redistribute among the States. It was then handed off to the Empowered Committee of Finance Ministers to lay the road-map for its implementation across the Union. Since there was representation of the states in the committee, the idea of national-level GST was opposed. Which state would want to lose its revenues or even the control over its revenues? Finally, a compromise was reached with the dual-GST model, which included a state component too. But as we will see further, the compromise does not necessarily restore control back to the states. The idea of GST - whether a national level GST, as it was to start with, or a dual GST, as it is being proposed as a compromise now - has come top down from the Union to the States. The States have only agreed to it as a compromise and never wanted such a structure in place. When the States did not want what gave the Union the legitimacy to impose a new taxation structure on them? Note that by legitimacy I do not mean Constitutional legitimacy; I am rather questioning the invasive and imperious attitude of the Union Government in a federal setup comprising several diverse states, each with its unique history, culture, issues and state of socio-economic development. ..the GST Council, as a constitutional body, impinged on the legislative sovereignty of both Parliament and the State legislature and would jeopardise the autonomy of the States in fiscal matters. The GST Council will be setup with the passage of the Goods and Services Tax Bill. It will be headed by the Union Finance Minister with the state Finance Ministers as its members. This council will be responsible for the categorization of goods and services, and will decide the tax rates on the same. In matters pertaining to taxes and revenues, all States in the Union should abide by its orders and decisions. What democratic legitimacy and credibility will an elected body retain, when its own matters are decided by a superseding external council that is nominated? The concerns of sovereignty and autonomy of the States, expressed by the AIADMK are absolutely relevant. No doubt, there is representation of the states in the council. The council, as already stated, will have state Finance Ministers as members. But the weightage given to the states is something to be noted. The Union Government has decided to hold a weightage of one-third of the total votes for itself, and has given two-thirds' weightage to all the states put together. With this, the Union has ensured it has veto power of sorts for itself in the council. The States, needless to say will be dummies. Barring a few exceptional cases in which a majority of States may come to a common agreement, this setup ensures the Union has total control in all matters of indirect taxation in the country. States that are ruled by the so called 'national' parties, usually have to toe the line of their party high-command, whose agenda is primarily focused on holding the reins of power at Delhi. The interest of the people of the State comes next to this agenda. While this will tilt the balance of power more in favour of the Union Government, those States with less influence in the Union and those ruled by state-level parties will find it much harder to influence any decisions in their favour. It is also being said that the States can appeal to the council. But a democratically elected government going to a council for matters such as its own taxes and revenues is fundamentally opposed to the idea of democracy and federalism. A legislature elected by the people should hold these powers, not a council or a committee. It also becomes much tougher for the states to come up with and roll out any new or innovative economic policies. They all will have to operate within the limits imposed by this one framework decided by the council. Who will really benefit from economies of scale? I also want to address the argument of integrated market and economies of scale. Who does this benefit? It certainly benefits businesses and enterprises that are well established and have large scale inter-state operations. But what if the states want to take a different approach to nurture local entrepreneurship, for example? What autonomy will they be left with to roll-out an economic policy favouring local entrepreneurship when a uniform framework is already decided by and rolled out from a committee sitting in a far-off Delhi? Do we really need an integrated market? Do we really need economies of scale? Can our people leverage the so-called economies of scale effectively? These are questions that each state and its people should discuss, debate and take decisions on. Rolling out from Delhi, a single policy for diverse peoples, makes little sense. In fact, it comes with the attitude of 'I know what you need better than you do' - violating the fundamentals of free choice, liberty and democracy. By this I do not want to sound like a conservative opposed to economic progress. In fact, in today's world, free and democratic countries have attained much stable and viable economic progress in comparison to autocratic, dictatorial or less democratic ones. The USA, termed as the epitome of free- market economy does not have a unified, integrated market. The sales taxes vary across states. In states like Alabama, Oregon, New Hampshire etc., there is no sales tax at all. In contrast, California has the highest rate of sales tax. These rates are decided by the States themselves, the Federal Government has little say in it. To add to it, the cities, the counties and other local bodies may levy additional taxes. It is not just sales taxes, the States have their share of income tax as well, which is totally a Union subject in India. The USA has shown that a free market does not necessarily have to compromise on liberty of its people or the autonomy of its states. Another argument in favour of GST is the ease of doing business in India, as businesses do not have to deal with different tax structures in different states. This argument too does not hold any water, when you look at countries like the United States. Despite different laws and taxation structure across different states, USA is way ahead of the Indian Union in this parameter. Lot is being said about federalism, particularly co-operative federalism, of late. But the GST in its current form will be disastrous to the autonomy of states and the overall federal setup of the Indian Union. Here is a video recording of a talk on the same subject that I gave at Total Kannada, Jayanagar, Bengaluru, on the 13th of March. In this talk, which is in Kannada, I make the same arguments of democracy, federalism and liberty in purview of the GST bill. Comments / feedback/ discussion welcome. Goods and Services Tax (GST) has been one of the most debated subjects in the last several months. The introduction of GST is expected to streamline levying and collection of indirect taxes on the supply of goods and services in the Indian Union by being a comprehensive tax that will subsume several other taxes levied by both the Union and the states. By reducing the cascading effect of taxes at every stage of supply, it is expected to reduce the burden of tax, and benefit the industry as well as the common consumer. While its expected benefits are still being debated, I would like to explore the much less talked about implications of the GST: What does GST mean to the federal setup of the Indian Union? What does it mean to the Union-states relationship? What does it mean to the fiscal autonomy of the states? In an interview to Vijaya Karnataka, a Kannada daily, last week, renowned Kannada litterateur S L Bhyrappa has advocated knowledge of Sanskrit as a necessary requirement for learning Kannada and for writing quality literature in the language. To justify his claims he not only mentions the examples of the poets of the yore like Pampa, Ranna, Janna and Kumaravyasa, but also cites the examples of the poets of the modern 'Navodaya' literature -who all had good knowledge of Sanskrit. He further goes on to say that Sanskrit grammar is pretty much similar to Kannada grammar and that possessing elementary knowledge of Sanskrit is a must. This is not the first time that Bhyrappa has made such claims. In fact, just about a month ago, in a programme organized by 'Samskrita Bharati' in Mysuru he had claimed that it is impossible to write top grade Kannada literature without the knowledge of Sanskrit. With all due respects to the litterateur’s contributions to the flied of Kannada literature, it must be said that the above claims are not based on scientific facts. Consider the languages like Latin, Greek, Persian, Arabic etc. These languages rose in prominence in different periods of history, and evolved mature literary traditions. There is also no dearth of scientific literature of the corresponding ages in these languages. In the same lines, in the modern era, languages like English, French, German, Italian, Japanese, Korean etc have made great progress, be it in the field of literature or science. It should be noted that these languages, be it in the yore or in the modern era, did not require Sanskrit to evolve top quality literature. If you take the instance of Kannada, it is said that the language came to be written about 2000 years back. 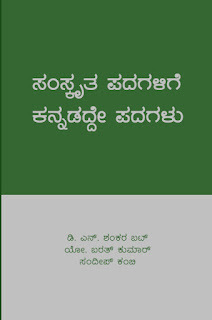 It is undisputed that that first pieces of literature in Kannada were heavily influenced by Sanskrit. Kannada poets of those days, not only borrowed plenty of Sanskrit words but followed the Sanskritic poetic tradition too. But prior to this development, Kannada had evolved into a full-fledged language over a period of thousands of years, spoken across a large part of the Deccan. Such development and evolution of the spoken language did not require Sanskrit at all. It is well known and accepted that Kannada and Sanskrit evolved from different roots, and hence linguists classify them under different language families (Dravidan and Indo-European respectively). Coming back to the subject of literature, by the time Kannada literature blossomed, Sanskrit literature was already at its zenith. So it is natural for the Kannada poets of that time to be heavily influenced by the Sanskritic literary tradition. Had there been another language in place of Sanskrit in those days, the Kannada poets would have undoubtedly been influenced by the poetic tradition of that language. For example, many European languages have imbibed the literary tradition of Latin and not that of Sanskrit. Needless to say, such influences depend on cultural, geopolitical, commercial and religious factors prevalent in those times and in those territories. Hence the influence of Sanskrit literature on Kannada too should be seen in the light of cultural, geopolitical, commercial and religious factors prevalent in those days in the Kannada speaking regions. Considering Kannada as incapable or incomplete without Sanskrit is a mistake. Can one consider the Vachana literature that developed at about the twelfth century as lacking in quality just because it developed natively, and did not follow the Sanskritic tradition? That is impossible. There are hundreds of folk songs and epics in Kannada, can they be considered lower rung or not of top quality because they are not in the Sanskritic tradition? Looking at it scientifically too, any subject that can be expressed in one language can also be expressed equally well in another language. There is no evidence that suggests that one natural language is somehow better than another in expressive power. So, based on Linguistics science, there is no difference between languages that are considered to be classical and languages that are called as tribal. For example, any subject that can be expressed in a classical language like Latin can also be expressed in a tribal language like Xhosa. One may consider Latin as more refined, but the concept of refinement is quite subjective. Hence one cannot, in absolute terms, consider Latin as somehow more refined than or superior to Xhosa. One can only say that both languages are equally beautiful and that they differ in the forms of beauty. The advocacy of Sanksrit for learning Kannada, and considering Kannada incapable of superior literary expression without the support of Sanskrit arise from ignorance of the above facts. The beauty of a Kannada expression and the beauty of a Sanskrit expression differ only in kind and not in quality. Both are equally beautiful and one is not superior to the other. But only if one's opinion is heavily prejudiced in favour of Sanskrit, can one come to the conclusion that only Sanskrit is capable of top quality literature and that languages like Kannada require the support of Sanskrit. Vachana literature has already proved that such opinions as incorrect, several centuries ago. At about the same time that Vachana literature bloomed, i.e., in the twelfth century, a Kannada poet by name Andayya showed that beautiful poetry can be composed without using Sanskrit words by writing 'Kabbigara Kavam'. In the twentieth century, Kolambe Puttanna Gowda's 'Kaaloora Cheluve' and 'Achchagannada Nudivanigalu' are shining examples of the beauty of native Kannada. It is true that Sanskrit has a great literary tradition and there is a wealth of knowledge in the language. The study of the language and its literature should be, no doubt, encouraged. But words like 'Sanskrit is a necessary requirement for writing quality literature in Kannada' are far from truth and derogatory in nature. We welcome unsolicited submissions to Karnatique. Just send your article to karnatique at gmail dot com. If your articles are in line with our editorial policy, we'll be happy to publish it.